Firefox's Web Based Protocol Handler support has to be one of its hidden gems. Once a handler is registered, you gain especially quick access to specific content on the web. 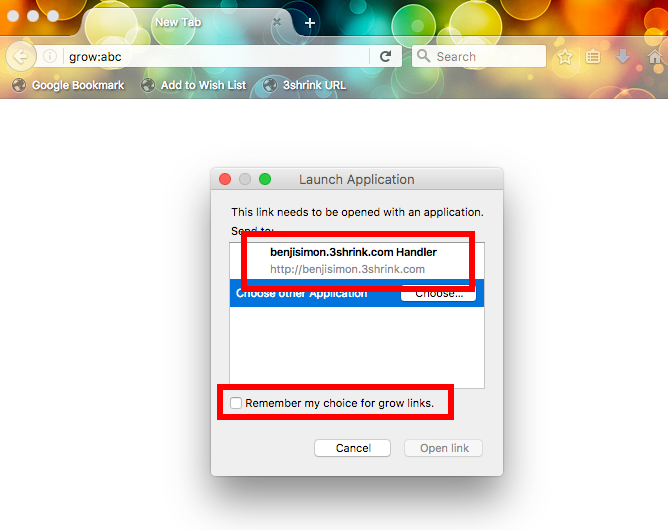 For 3shrink, this means quick access to the URL behind the 3 letter codes the site produces. The protocol handler serves as the complement to the 1 click bookmarket, insuring that both growing and shrinking a URL is as streamlined as can be. Note how the code above prompts the user to enter the protocol name. That way, you could have personal and business and point them to two different 3shrink domains. I'm amazed I haven't found more uses for web based protocol handlers. For advanced users, you can offer a terrifically fast user experience at almost no cost in terms of development time.